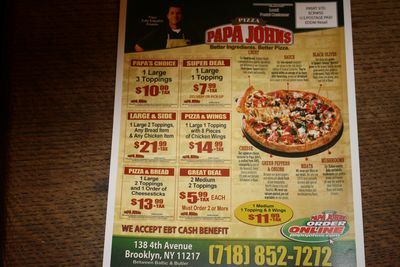 "We accept EBT Cash Benefit" reads the direct mail piece from this Papa John's pizza restaurant mailed to Brooklyn households. Something for the non-food-stamp-receiving taxpayers to think about as they are cooking dinner or washing the dishes tonight. I find myself noticing more and more of this sort of thing, not just on ads, but in storefront signage, and not limited to poor neighborhoods, either.